With spring on the way and the body yearning for lighter, fresher food, it might be a good time to have a look at vegetarian cooking in Krakow. I have a lot of respect for vegetarians. Many of those I know have a tough time finding good food at the best of times, and it surely takes true dedication to be a vegetarian in a meat-lovers’ paradise like Poland, where a meal isn’t considered a meal unless it includes meat, and someone who doesn’t eat meat attracts incomprehension. Times are changing though, and with an estimated two million vegetarians in Poland, even Krakow has a handful of vegetarian restaurants. So I think it’s such a shame that the vegetarian food on offer in Krakow’s restaurants is so poor. In speaking to some long-term vegetarian friends here in Krakow, I was struck by how they could pretty much all recite by heart the menus of the three main contenders: Momo (ul. Dietla), a branch of the Greenway franchise (ul. Mikolajska) and Vega (ul. Sw. Gertrudy and ul. Krupnicza), suggesting that whilst the food was acceptable enough for them to eat there often, these restaurants weren’t too concerned with seasonality or creativity. They all agreed that life had become a lot easier over the last couple of years; they had to explain less frequently that they didn’t want their pierogi smothered in bacon fat, and the growing availability of meat substitutes such as soy and tofu means that their home cooking horizons have expanded further. So it was with interest that I picked up a flyer for a new vegetarian bar on pl. Matejki and arranged to go there for dinner with a Polish vegetarian veteran (18 years). Glonojad (Algae-eater) had none of that slightly unwashed, hippy feel of Momo, and a short but more interesting menu than Vega. Clean, warm, inviting, it’s like a more modern version of a milk bar, with the names of the all-vegetarian dishes displayed above the bar, but unlike a milk bar it also serves bottled beer and wine, fruit juices and soft drinks and it has free Wi-Fi and a computer for clients to use. We didn’t ask whether the wine is vegetarian (animal products are frequently used to clarify wine), but the beer is. The menu is mercifully short, which I always take to be a good sign that the dishes are freshly made to order, and we ordered falafels and a spinach pancake. The dishes arrived quickly and looked good; you get a lot of food for your money here. However, once we started eating them, our hearts sank; this isn’t going to be a beacon of vegetarian cooking in Krakow. 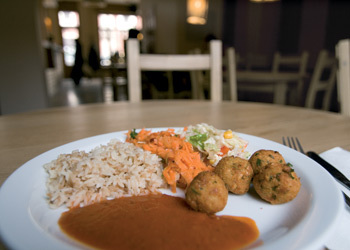 The under-seasoned falafels came with perfectly cooked buckwheat kasza and a choice of two standard Polish salads (you know what I mean – grated carrot with raisins, Chinese leaf with mayonnaise and sweetcorn, sauerkraut etc). I’ll admit I’d been spoilt by the extraordinary falafels I’d had in Berlin recently, which came wrapped in a freshly cooked flatbread and drizzled with tahini, but even so, using buckwheat as an accompaniment seems to me like a strange combination. Almost as though they were trying to fill my stomach rather than tickle my taste buds. I would have written it off as a glitch in the kitchen were it not for the fact that the pancake was also under-seasoned and the spinach filling did not appear to have been cooked with any aromatics such as garlic or onion. It was just bland. Overall, it was a disappointing experience and we agreed that no one in Krakow has yet cracked vegetarian cooking, which can be spectacularly tasty. That’s not to say that Glonojad is to be avoided. Not at all. It’s a pleasant place to be in and you get a lot of food for your money. It’s just that it could try harder.